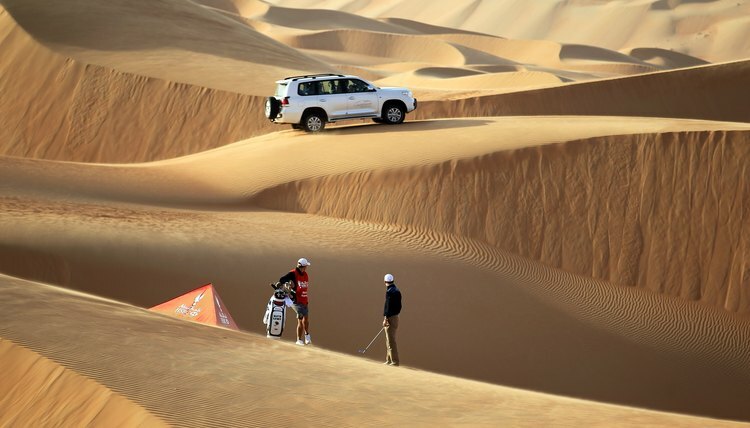 All pro golfers travel a lot, but only the best, such as Martin Kaymer, ever do a photoshoot in a sand trap this big. A professional golfer plays the game for a living, as opposed to a golf pro, who receives a salary from a club. A typical professional golfer is always on the move, traveling from tournament to tournament. The more well-known golfers travel by plane and stay in luxury hotels or rented homes, while the typical player on a minor tour drives to the next tournament and stays in a motel. The pressure to earn enough money to cover day-to-day travel and living expenses is a key difference between the life of a successful major tour golfer and the typical playing professional. There are numerous men’s and women’s tours worldwide, but the PGA Tour is the top of golf’s food chain. In 2011, 89 golfers earned at least $1 million on tour, with 216 earning at least $100,000. At the same time, tour golfers also have large expenses. Caddies, for example, typically receive at least 5 percent of a player’s earnings. Even if they happen to live near a tour stop, players are on the road most of the season -- depending on how many tournaments they enter or qualify for -- and must pay all their travel costs. Tour player Jason Day and his wife Ellie, for example, literally live on the road during the season, driving a motor home from one tournament to the next. There are several ways a player may qualify for a single tournament, but long-term success on the PGA Tour requires a player to remain exempt from qualifying. Otherwise, a golfer may have to play on a lesser tour and try to work his way back to the PGA. Unless a player wins a major tournament, he typically must be among the top 125 on the official PGA Tour money list at the end of the season to retain his tour card for the following year. LPGA players must be among the top 90 plus ties on that tour's official money list each year to keep their tour card. What Does a Professional Golfer Do Between Days of a Tournament? How Do PGA Pro Am Tournaments Work?